Why Watch it Today? : Mario Bava released his classic horror movie The Mask of Satan/Black Sunday on this date in 1960. 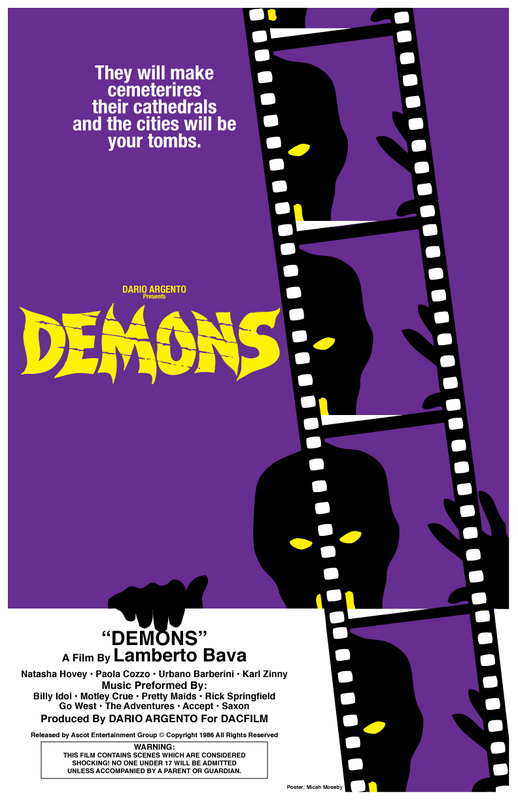 His son Lamberto’s Demons references the earlier work in the form of the titular mask, featured in the film within the film and in a prop that infects the first theater goer to become a demon. Unlike Mario’s stately, creepy Gothic horror masterpiece, Lamberto’s film is a thrill ride, action/horror that would probably be considered tongue-in-cheek if it wasn’t so deliciously mentally challenged. Not a great film, by any means, but a fun one (where else will you see a man drive a dirt bike while wielding a katana to fight the zombie-like demons his fellow film goers have become?) with a wonderfully dated 80s soundtrack. This entry was posted in Action, Demons, Horror, Independent, Movie of the Day, Zombies and tagged "terror in the aisles", Berlin, Billy Idol, children of famous people, cursed objects, Dario Argento, demon, dirt bike, gore, grindhouse, homage, it's not over, Italy, Lamberto Bava, mask, Motley Crue, movie theater, pimp, pop soundtrack, punks, Rick Springfield, samurai swords, teens, twist.